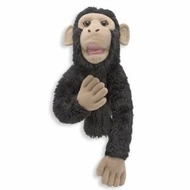 Young puppeteers will go ape for the Melissa and Doug Plush Bananas the Chimp Puppet! Bringing Bananas to life is a breeze. One hand is used to manipulate the mouth and facial expressions, while a wooden rod is used for gesturing. Puppet show lovers will fall in love with Bananas bright eyes, friendly smile, and furry coat. A detachable rod is included for right or left handed use.